When you are looking for a web host, you generally look for someone that has a long history of reliability and a strong uptime percentage. While InterServer does not have the user base and history that many of the top web hosts in the industry have, they do provide a significant advantage over many other providers. What is this advantage? Customer support. 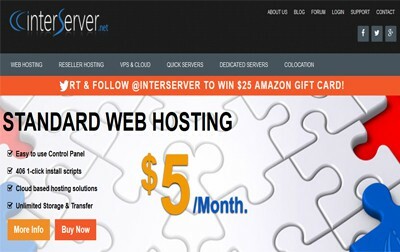 InterServer is a small New Jersey based web host that has quickly developed a reputation for providing some of the best customer support in the industry. In addition to providing guaranteed uptime (99.9%) and a price lock guarantee, they also offer a 30-day money back guarantee to ensure that you are completely happy with their services before making a long term commitment. InterServer has quite the variety of different hosting plans available to users. They offer 3 Managed Web Hosting Plan, including Windows, Standard, and WordPress Web Hosting options; several different VPS and Cloud Hosting Plans, and Dedicated Server Hosting Plans. While their Managed Hosting plan is fairly standard, their VPS and Dedicated Server Plans offer many customizable options that make it difficult to list the features within a short review. Windows Web Hosting – The rate comes in at $5/month. At this price you can expect to receive unlimited storage, unlimited data transfers, 20 websites/domains, and unlimited email accounts. You have to pay $20/year for SSL Certificates. Standard Web Hosting – The rate comes in at $5/month. At this price you can also expect to receive unlimited storage, unlimited data transfers, unlimited email accounts, and unlimited websites/domains. SSL certificates are $20/year. WordPress Web Hosting – For this plan, the rate comes in at $8/month. At this price you can expect to receive unlimited storage, unlimited data transfers, and unlimited email accounts. It should be noted that you can only have one domain on this account and that SSL certificates are $20/year. The VPS Hosting Plans, as has been mentioned, are customizable and vary in prices. While prices start at $6/month for 1 CPU Core, 1024MB of memory, 25GB of storage, and 1TB of transfer data, their largest plan goes for as much as $160/month. Prices also vary depending on whether you go with a Linux or Windows operating system, with Windows being the more expensive option. InterServer Dedicated Server Hosting plan starts at $59 per month, which is considered as the cheapest dedicated solutions offered so far. They own and operate dedicated servers in its data center in Secaucus, New Jersey. They offer base pricing for each CPU configuration. Customers are allowed to modify things, including: memory, hardrive, bandwidth, operating system, and control panel. What Do InterServer Customers Say? While it has so far been determined that InterServer can be trusted as a reliable web host, it is always good practice to see what former and current users have to say. Let’s take a look at some of the positive and negative reviews from around the web. As has been mentioned, most users have been very happy with InterServer. While they have had some uptime issues in the past, the fact that they are a continually growing company means that you can expect to see some problems at times with reliability. With their around the clock support, however, they make sure they are there for you when you need them. The unfortunate reality of web hosting is that, even if you provide top tier support, it is impossible to satisfy everyone. While most users have had nothing but positive things to say about the great service and support that InterServer provides, there are a few that are not quite as happy with what they offer. The real strength of InterServer lies in their customer service. Being a small company enables them to deliver around the clock support to their members. Not only do they have lightning fast response times, but multiple users have raved about how thorough they are in making sure that their needs were satisfied. Providing strong value is another way that InterServer excels above many other web hosts in the industry. Their affordable pricing, combined with their price lock guarantee and top notch service, makes them one of the great values on the market. Many users love the fact that they can customize their VPS Hosting Plan to meet the unique needs of their website and/or business. In addition, the scalability of the VPS plans allows users to start with lower priced plans and easily upgrade as their business grows (without downtime). It is obviously tough to beat an uptime guarantee that tops out at 99.9%. This guarantee continues to speak to the great value that InterServer provides to their users. Users looking for even more flexibility and personalization will be happy to know that, with the VPS and Dedicated Server Plans, website owners can choose between Linux and Windows operating systems. It should be noted, however, that Windows is slightly higher priced than Linux. Have you or are you currently using InterServer as your web host? If so, we would love to hear about your experience with them. We encourage you to provide us with a quick review so that we can share the word about this web host with those looking for a new provider. Their pricing plans are affordable and guarantees price lock for the life of the account. Provides great options for scalability. They do not only provide excellent customer support but knowledgeable as well. Downside: SSL certificate is not included.